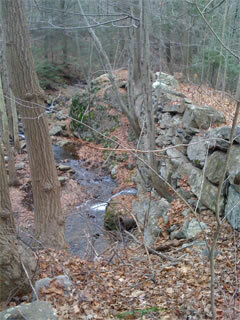 The start of the trail crosses an old stone dam and brook. For a Downloadable Trail Map PDF of this trail, click here. Also known as Eagle Ridge or “The Pavement” this part of the Central Division of the Mattabesett Trail is located in Haddam’s northwest corner, just northeast of Miller’s pond. It is accessed from the south side of Brainard Rd. where there is a pull-off for 4-6 cars. For driving directions to this point, click here. 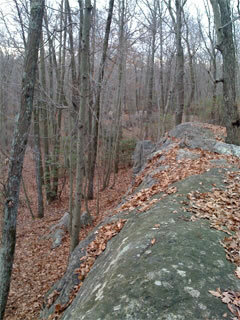 Part of the Connecticut Forest and Park Association, the trail is clearly marked with blue blazes. The first 75’ are the most difficult, as you walk down a steep path and cross a brook via stones. After that, it’s easy going up a moderatel steep, nicely cleared trail, through mountain laurel and mixed forest. The path flattens and continues along a very long granite outcropping through the forest that gives the trail it’s nickname “The Pavement.” Continue on until a mile in where, voila!, one of the most beautiful, far reaching outlooks you’ll enjoy in this region! The trail continues for another 1.4 miles where it meets Foot Hills Rd. 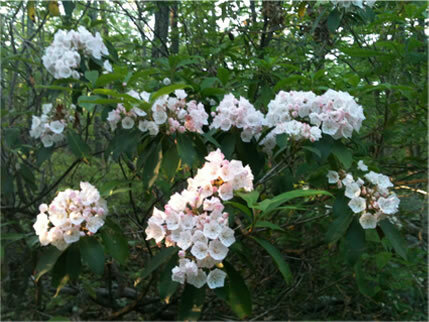 Connecticut’s state flower, the Mountain Laurel, is richly represented on this trail. 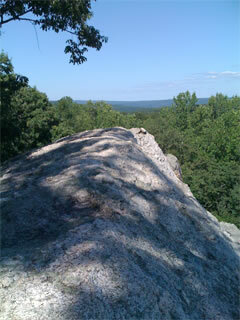 One mile in, the hiker is richly rewarded with one of the region’s best views, from a granite ledge suitable for picnicking.